I laugh about the naivete of the elderly woman. But perhaps I laugh too soon! Don’t I do that same thing when I hurry to connect with God so some error can be corrected, or some need fulfilled, and then go about MY own busyness? Prayer is like the electricity. Go about my business until the next time I need to find the light. I think my first mistake is that I go about MY business. It is not MY business. It is God’s business, and if I only stop when I need something I am no wiser than the elderly woman who turns on the lights only to find a match, and the turns them off again. Peace, and Joy, and Awareness. In the reading from Joshua we hear again the words “Decide today who you wish to serve.” When the people responded they remembered all the gifts that the Lord had provided for them and proclaimed that they would serve the Lord. I am reminded that I decide daily who I wish to serve. As with any vow, baptismal, marriage, or religious, making a decision is not something that is done on a particular day and it is finished. The daily living is the evidence of that decision. Perhaps I should make a list of reasons why I have decided to serve the Lord and refer to it on a regular basis. Jesus knows that a promise given is not the same as a promise lived. The option to depart from our initial response is always before us. That is why Jesus reminds us the “the words I have spoken to you are Spirit and life.” We need to renew our choice and be strengthened daily. It is too easy to be led astray by other messages which bombard us. In addition to Jesus’ words, my list would keep me mindful of all that prompted my response. I need help in staying faithful to my decision to be your follower, Jesus. Keep me mindful that you have spoken the words that are Spirit and life and that I need to continually return to them. My speech and actions must show that I know you are the Holy One of God and there is no one else to whom I can go. Daily you gift me with the opportunity to begin again to live my decision to follow. May I use each day well. Amen. God loves and cares for the sparrows. God clothes the lilies of the field with such beaury even though most of them will never be seen. God loves us so much even the hairs of our heads are numbered. However, let’s think seriously about those words of Jesus for a moment. Jesus doesn’t say things without their having meaning for us. So what does it mean, “The very hairs of your head are numbered”? Losing a hair is an everyday experience for most of us. We do not stop to check how many hairs are caught in our brush or comb. We simply pull them out of the bristles or teeth and toss them away. So much for one hair or two or three. Why did Jesus make such a big thing of it by telling us that God, the great, powerful, loving Creator, knows how many hairs we have? I think it might be because he wanted to impress on us that God wants to be a part of everything in our lives, even things we barely notice. …and all that is before you begin your breakfast! Just think! God wants to be part of each and every action, thought, smile, frown, feeling, etc., etc., etc. Now, it doesn’t seem possible for us to be aware of God at all those seconds. But maybe it would be a good idea to try to recognize God’s interest now and then. AND the more we do it now and then, the more often we will do it. Marvelous isn’t it! The 16 things before breakfast are not complete, and some may be very different from our own. So, make your own list; maybe from breakfast to going to work, or doing the chores, or driving to the grocery. You get the idea. So, seek God. God wants to be found by you. Where will you see God next?! Peace and Beauty be yours today and always. As I reflected on the readings for this Sunday, I seemed to focus on the words “be filled with…“. In Proverbs we will be filled with wisdom; in Psalm 34 we are to be filled with joy. The reading from Ephesians tells us to be filled with the Spirit, and in John’s Gospel Jesus reminds his apostles and us to be filled with the Bread of Life. Can we empty ourselves enough to take in all these gifts? Are our eyes open to see the gifts in our lives? Bountiful God, help us to be open and eager to take in all the gifts you send. Let us use the wisdom you send to make our lives happier and to share that happiness with those we meet each day. The power of a parent’s blessing is greater than you can imagine. If it happens regularly, it becomes a great bonding tool. Let me tell you about Jack and Pete. Jack was a slightly framed man who sold insurance for a living. He was a man of great faith who treasured his faith and his wife and three children. Jack had made it a practice to bless his children every evening as they went to bed. If his work took him from home at night, he would call and speak to each child a blessing. The words were simple: God bless you, Pete; Love and blessings, Jane, etc. Simple, but words expressed every night. Jack and his wife were delighted when they could finally afford to buy a station wagon. The whole family admired it, but especially Pete who was 16 and had just acquired his driver’s license. It was a busy day for Jack’s family. The younger children had after school activities. Lora, Jack’s wife, was visiting her Mother and would be home by dark. Jack had a meeting of the volunteer firefighters’ association at a restaurant three blocks from home and Pete had football practice and was the first one home. The dark blue station wagon sparkled in the light coming in from the garage door window. Pete went out to admire it once again. That’s when the thought came to him: Why not take the car for a drive and treat his buddies for a ride? He would probably be back before Dad and Mom got home. So that’s what he did. It was a sharp curve, and a very big tree that was Pete’s undoing. He hit the tree, his foot on the gas instead of the brake. His riders had been dropped off, and he was unhurt but the car was totaled. News like that travels fast in a small town, and before the police got to the scene of the accident, Jack was there. Pete was standing alone, unhurt, with tears running down his face. Jack only asked if he was all right. The two of them walked home in silence. The blessing of his father had such an impact on this big, strapping boy that it would be the worst punishment of all not to be blessed by his dad. The earlier you begin to do so, the easier it will be to continue. However, there are always times when that phrase can be uttered. Birthdays are a good time to start it, or holidays, like Thanksgiving, or Christmas or graduation. The idea though is to say it often enough that children come to expect it. 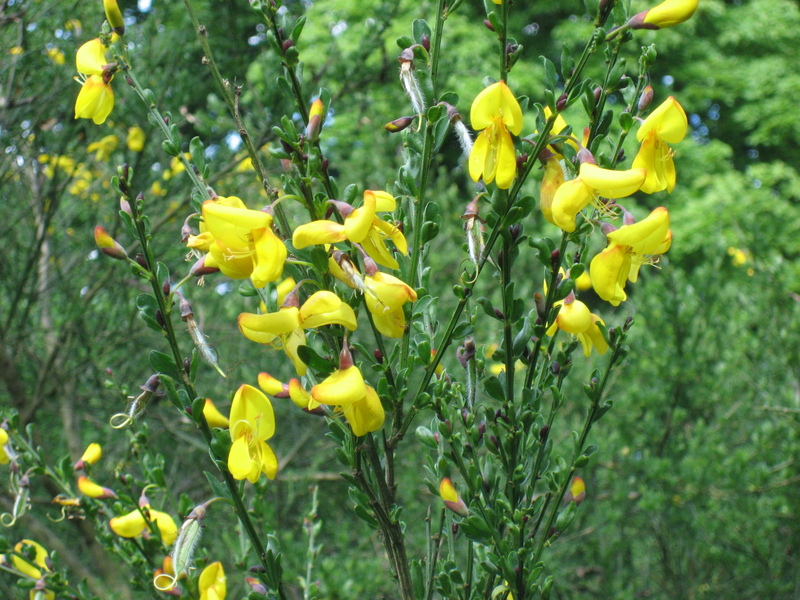 Cytisus scoparius (broom tree) photo. What forms of life have been deeply affected by this summer’s drought? We are very much aware of the resounding response to this question. At this point in time, many of us may feel like joining Elijah under the sweet-smelling broom tree. However, note the persistence of the Angel to move Elijah to get up, to eat the cake, to drink the water and to continue his journey. What is under our broom tree when challenges, disappointments, and concerns feel like they are overwhelming us? Elijah needed sustenance and so do we. The words of the psalmist reveal where we need to turn. Could we begin our turning to God by recalling those times when we experienced God providing EXACTLY what we needed to stay ALIVE? Would we then be willing to share with family, with a friend or with our neighbor what we found under our broom tree? Loving God, we are almost breathless when we realize what has been placed under our broom trees. Thank you for helping us to taste and see your goodness. With your grace, may we continue to LOOK to YOU as the SOURCE of ALL that we humbly need in our daily living. Amen. Gathering with family or friends at a meal is always a special time. If you are someone who often eats alone, it can evoke thoughts and memories. The thought from Scripture, “Wisdom has set your table,” gives all of us something to reflect on. How has Wisdom set our table? What’s the menu? Often today we hear others say, “I’ve got enough on my plate already.” You can be certain it’s not food! In most cases, it’s a complaint. Perhaps we can request from the Spirit that sets our table to bring on the bowls of laughter and humor. Maybe silverware of good conversation and justice sharing. Perhaps a plate full of pride that’s grateful for all the good of the day wouldn’t be half bad either. A change of menu could mean no pounds, but certainly a lighter and happier heart.